Tim explains one reason why the sound /d/ sometimes disappears. Tim's back in his pronunciation workshop. This time he's finding out why English speakers sometimes don't pronounce the /d/ at the end of words like 'boiled' and 'steamed'. 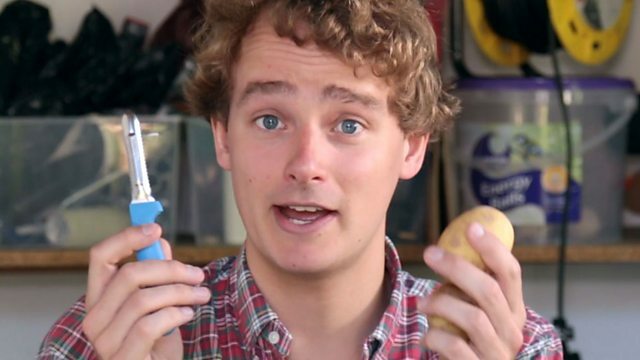 Find out more - and learn how Londoners prefer their potatoes! It’s very difficult to say /d/ when it comes in between two other consonants. Your mouth has to do a lot of work. So in many cases the /d/ is not pronounced. 'Boiled potatoes' becomes 'boilpotatoes'. And 'steamed potatoes' becomes 'steampotatoes'. This is called elision. Here are some more examples. I found six pens down the back of the sofa. I used the oven gloves to hold the hot pan. My boyfriend lives in London. I can't believe I failed my final exam. She's bound to find something soon. He tries hard, but he just can't hold down a job. We hope that was useful. In Unit 10, Dan brings you another English Masterclass - in this one, he'll be looking at the future continuous. In News Review and LingoHack you can find out which words are making the headlines - and Tim will be back with the pronunciation workshop as usual. See you there! When the /d/ sound comes between two other consonants, English speakers often drop the /d/ sound completely. My friend let me borrow his car.